Thanks to everyone who has left such nice compliments and asked questions. I hope this helps someone become inspired to build their own desks!! Thank you all for your continued interest in my desk! It makes me so happy that so many people have taken this project and built their own. You all are amazing! The length of the pieces can all be custom, so it is really dependent on how big your space is. Mine is 6 feet long, and 38" wide. That is because the cube shelf is 36" wide, and I added 1" on both sides to cover the side boards. The side boards are 6 feet long also on the main desk. A sheet of MDF comes in 8ft lengths, so the 2 ft that were cut off of the bottom to make my main table were used to make the side table, or "L". I had Lowes cut 10" from the entire length of the board first, then cut the rest of the board at 6ft. The MDF I used was 1" thick for stability and balance on my desk. Here is a link to read more about MDF and why it is so wonderful for construction projects. Alternately, you could change the cut order, and have 2 ft cut off the end first, then 10" from the main piece. This would give you a side piece 48"x24" in size. That was too long for my space, but it could work for you! I used this technique to join the tops of the desk to the 1x4" side rails, and to join the "L" side to the main area. There aren't any screw heads showing from the top of the desk, they are all inside. This isn't the easiest way, but it does look sharp when it is finished. 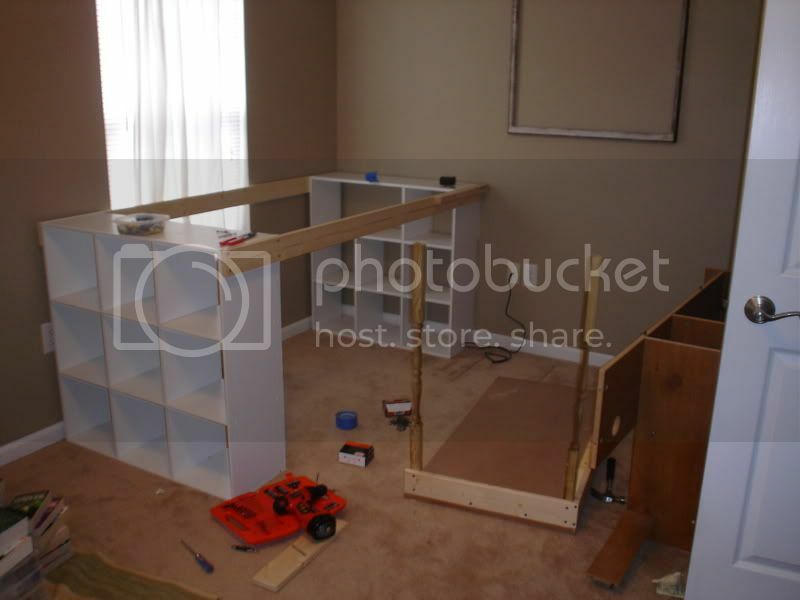 *On some of the holes, I did use a drill gun to first drill a hole, and then the screw. This helped the screw go in a lot easier, especially on the parts that I had to drill upwards. *Talk to your Home Depot or other hardware store employees, they are full of suggestions about construction. If you don't like this method, they can suggest many others, and direct you to the proper hardware. Wow,it looks great and you explained it so well. I'll be linking to this post. 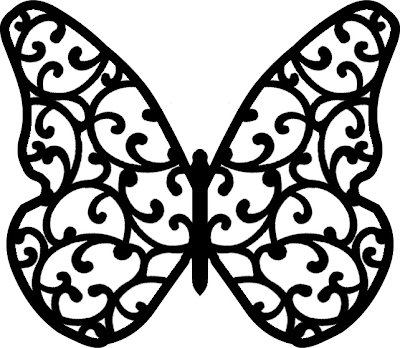 I hope it sends you a few extra visits! That is a fabulous desk! You gave me inspiration for my next blog post because I have a DIY craft desk as well. fabulous, great job! Just what I would love to have. Wow, that is so nice!!!! 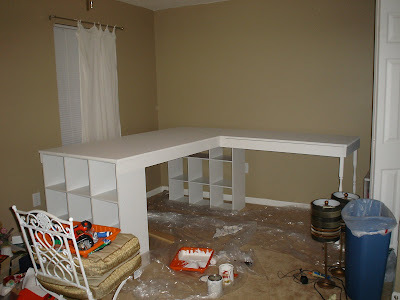 I absolutely love seeing how things and furniture transform with white paint... You did a great job with that desk! OMG I was looking at a desk at Pottery Barn the other day for 1400, and I said to my husband, I am sure with two of those shelves from Target and a piece of wood from H.Depot you could make this....WOW we were so on the same page! Thanks for the instructions, now he has not reason not to do it for me.!!! THat is amazing! That looks awesome and sort of easy to do! Thanks so much for the tutorial! This is fabulous. And just when I had given up on ideas to do a large desk with storage in a spare bedroom, you come along. I'm totally doing this! Thanks so much for the inspiration!! I love this idea! I'd love to try to to do this some day! I love this!! I am going to pass this along to my husband ASAP! The only other thing I've found is the $1,000 craft desk from pottery barn...too expensive for me! But this is even better. Thanks so much! Wow! With a little more support, I think this would also make a great computer desk. I think I'll make one when I move out from my parents! This looks to be taller than a usual desk. How tall is it. How did it work out for sewing? can you reach your foot pedal? good eye! it is taller than normal, which is great for standing and cutting fabric or working on projects. i couldn't reach my foot pedal normally, so i placed a box on the floor, that doubles as storage, and put the pedal on that. it works out just great. a foot stool or shelf would work also! I really like this project. Was wondering what you used to attach the left side of the table to the larger part (i.e. the unit with the Target cubicles on each end)? I didn't see any hardware listed in the supply list. Also, does the one sheet on MDF provide enough surface for both table tops? I really need a project I can do without depending on my husband. Please let me know what I need to attach the two table tops and how much MDF to buy. Thanks so much! You are amazing! I saved every picture for my husband. I WANT that desk! U are a freakin genius! I love that! I wish I were that creative and handy too! That is absolutely amazing! Well done. Wonderfully thought out desk! This turned out beautifully, man you have lots of craft space now. That is one amazing desk - I soooo wish I had the space for one. In my sewing room we used an old door as a table both for my dd's sewing machine and also as a space between us to cut and plan..
Love your bright room ! Love this desk and am going to tackle it next weekend for my little craft corner. How did you connect the two tops to each other? I didn't see details on that. Also, am I correct that the left side (for the sewing machine) was the top to the old desk? By the way, LOVE the little cup hooks you used to wrangle all those chords! I love love love this idea!!! So the DIYer in my had to try to recreate it. And so I did, I am so happy with the way it turned out!!! Thanks so much! I love your blog! Hi Marilyn, Yes the cube storage is very sturdy! It doesn't even wiggle a little bit, and I have quite a bit of weight on it. And the finish is well made also, no chipping or flaking. Good questions! How did you secure the tops of the desk in the corner? Is there a visable seam on top? I guess what I am trying to figure out, how is the sewing table side secured to the other side, or is it? Thanks so much for your help. 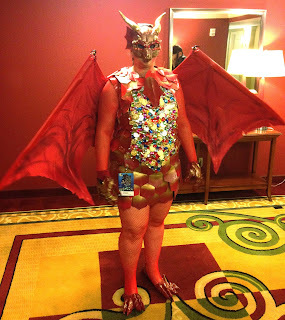 I am really interested in trying to make one like this for myself. This is the best DIY desk I have seen. 1. How are the two separate surfaces attached at the seams? 2. How did you attach the top to the base? Did you attach it from underneath or screw it in on top? 3. What brand and color paint did you use? 4. What are the smaller pieces of wood I see in the pictures of the view from underneath the desk, or is it just the angle in which the picture was taken? If you can answer these questions I would appreciate it so much! s.webb at hotmail.com THANK YOU! Excellent use of space . . . and on a budget, too! Thanks for sharing! I'm a writer as well as a scrapper, so this looks like a perfect desk. 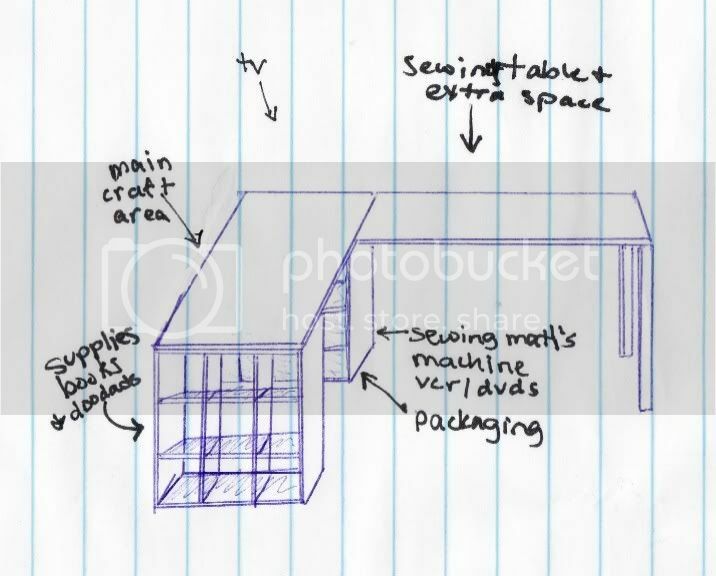 Hey everyone, I have updated the post with the dimensions of my desk- I hope that is heplful! Thans Janny, for the updates! Awesome. One question (so sorry! 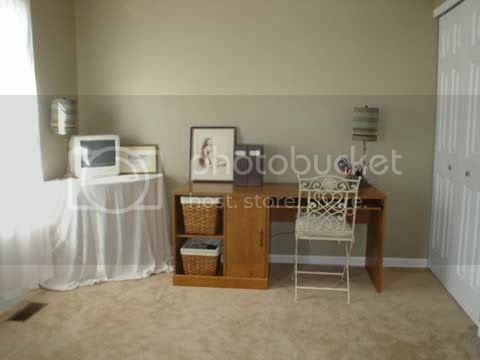 )...the side table looks so much larger than 2 ft. Am I reading something wrong? Fantastic! I am so impressed! I LOVE this desk! It looks awesome! I am wondering what height chair you use at yours? It looks to be a bar/counter height chair, but how many inches? This is great!!! 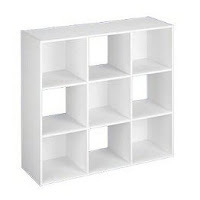 Quick question....it seems Target has 2 different cube organizers. The one I want (in white) is made by closetmaid....is that the right brand? I want to make sure I get something sturdy! Very Beautiful desks. I would like to have some in my house. Yet another believer here Janny! I customized the desk to my space and dropped down the table, but your instruction were clear, concise and obviously super inspiring!